Glass works. Midnight. Location: Indiana. Photograph by Lewis Wickes Hine, April 1908. Factory owners preferred hiring children because they were cheaper, less likely to strike, and more manageable than adults. However, factory work was grueling; a child working in a factory worked 12 to 18 hours a day, six days a week, for only one dollar. Many children began working as young as 7, tending machines in spinning mills or carrying heavy loads. By the mid-1800′s, child labor and its lasting effects on children’s health and education came under scrutiny of reformers. Churches, labor groups, and teachers were similarly outraged. Thus, many factories were ousted from the North and consequently found the South to be more accepting of the extensive use of child labor, especially in textile mills. By 1900, child labor standards and support varied dramatically state by state. A United States Census report from 1890 showed that over l.5 million children between the ages of ten and fifteen were employed. This number comprised almost 20 percent of all children in that age range. Just ten years later, the 1900 Census showed that over 1.75 million children between the ages of ten and fifteen were working in gainful occupations. Child labor peaked in the early twentieth century and subsequently declined as labor reform movements grew. 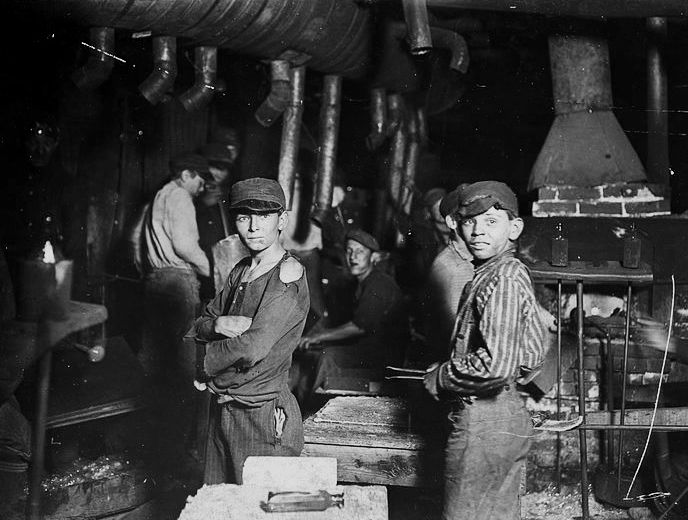 Furthermore, this time period saw an improvement in labor standards, increasing workers’ political power, as well as a demand for legislation to address child labor. Union organizing and child labor reform were frequently intertwined, and many initiatives were led by organizations such as the Consumers’ Leagues and Working Women’s Societies. These two organizations created the National Consumers’ League in 1899 and the National Child Labor Committee in 1904, which shared goals of challenging child labor through anti-sweatshop campaigns and labeling programs. The National Child Labor Committee developed an interrelated mission of ending child labor and establish free, compulsory education for all children, which ultimately culminated in the passage of the Fair Labor Standards Act in 1938, setting federal standards for child labor. As early as the 1870s, reformers began efforts to enact legislation prohibiting certain types of child labor. For example, in 1876 the Working Men’s Party proposed banning the employment of children under the age of 14. In 1881 the first national convention of the American Federation of Labor (AFL) passed a resolution calling on states to ban children under 14 from all gainful employment. In 1883, Samuel Gompers led the New York labor movement to successfully sponsor legislation prohibiting cigar-making in tenements, where thousands of young children worked in the trade. The first organizational efforts to establish a national child labor reform organization began in the South. In Alabama, a clergyman, Edgar G. Murphy, began to denounce child labor in the late 1890s. Advocating legislation to improve children’s working conditions, Murphy and his supporters faced great opposition, especially from the Southern Textile Association. In 1901, they created the Alabama Child Labor Committee, the first of its kind in the United States. In 1902, in New York, Florence Kelley, the head of the National Consumers League and a former resident of Hull House, joined with Lillian Wald, the founder of Henry Street Settlement, to influence the Association of Neighborhood Workers to appoint a child labor committee to investigate the problem of child labor in New York. Others on this committee were Robert Hunter and Mary Simkhovitch. In November 1902, this committee was organized as the New York Child Labor Committee. At the 1903 meeting of the National Conference of Charities and Corrections, an entire section was devoted to Destitute Children. The presentations included topics such as Child Labor and Pauperism by Jane Addams; Child Labor as a National Problem with Especial Reference to the Southern States, by Edgar Gardner Murphy; Use and Abuse of Factory Inspection, by Mrs. Florence Kelley; The Social and Medical Aspects of Child Labor, by Frederick L. Hoffman; The Sociological Work of the Cotton Mill Owners, by D. A. Tompkins; Humanity and Economics, With Special Reference to Child Labor, by Rev. C. B. Wilmer; Child Labor and Illiteracy by Hon. Hoke Smith; and Common Sense and Co-operation in Child Saving by Hastings H. Hart. Following the 1903 meeting of the National Conference of Charities and Corrections, Reverend Edgar Gardner Murphy made contact with the leadership of the New York Child Labor Committee, and together they began to plan the formation of a “national” organization on child labor reform. Invitations were extended to child labor reform advocates and interested people around the nation inviting them to a meeting at Carnegie Hall in New York City on April 15, 1904. On April 25, 1904, the National Child Labor Committee (NCLC) was formally organized and began their mission of “promoting the rights, awareness, dignity, well-being and education of children and youth as they relate to work and working” (Natanson, n.d.) . The leaders of the NCLC included major figures in social welfare. Among the fifteen members of the board of directors were: Felix Adler, Paul Warburg, Jacob Schiff, Florence Kelley, Robert de Forest, Edward Devine, Homer Folks, Rabbi Stephen Wise, Jane Addams, Lillian Wald, Graham Taylor and Benjamin Lindsey. The leaders of the NCLC represented the major figures in social welfare at the time. The NCLC evolved not only as the largest and most important national child welfare societies, but also as one of the major twentieth-century social welfare organizations. From the very beginning the NCLC carried out systematic investigations in order to learn and document the extent and characteristics of child labor in the different industries and states. At the same time, they studied the existing laws and statutes and identified a “uniform” child labor law. Needless to say, none of the existing statutes achieved the standards of regulation and enforcement that the NCLC considered minimum. It was then that NCLC activities turned into a fight for more and better state legislation. In 1907 the NCLC was chartered by an Act of Congress and immediately began to garner support and move towards action and advocacy. One of the first steps took place in early 1908 with the hiring of Lewis Wickes Hine. At that time, Hine was a teacher at the Ethical Culture Society in New York City. He had also worked as the staff photographer for the Russell Sage Foundation. In his work for the NCLC, Hine took some of the most powerful images in the history of documentary photography. Hine’s work for the NCLC was regarded with suspicion by business owners and management. To gain entry to the mills, mines and factories, Hine at times assumed the guise of a fire inspector, postcard vendor, bible salesman, or even an industrial photographer making a record of factory machinery. At other times he simply waited outside the workplace, photographing children as they entered and exited (Natanson, n.d). Hine’s photographs would significantly help awaken the conscience of the nation, and advance the reform of child labor laws in the United States. The NCLC began advocating for child labor reform at the state level. Soon, however, the group decided to work for a national anti-child labor bill. In 1916 the NCLC backed the Keating-Owen Act, which prohibited shipment in interstate commerce of goods manufactured or processed by child labor. The act passed and was signed into law by President Woodrow Wilson, but was declared unconstitutional in 1918 by the Supreme Court (Hammer v. Dagenhart). The NCLC then began to advocate for a constitutional amendment. In 1924, the Child Labor Amendment was passed, but never ratified. The amendment is still-pending today. The National Child Labor Committee continued its work into the 1990s. The American Child was a publication of the NCLC from 1919 to 1967.